Outdoor PUP Crawl Events Rained Out! Meterologists are saying it'll be raining cats and dogs on Saturday! The outdoor events of Shreveport DDA's Downtown PUP Crawl have been cancelled, but Robinson's Rescue and Rainforest Art Foundation's Art of the Dog Reception is still on! For more information about what's still happening Saturday, click here! SHREVEPORT, Louisiana – Rainforest Art Foundation hosts a public reception for Art of the Dog as an early Earth Day celebration on Saturday, April 6, 2019 from 5:00 PM to 7:00 PM. Art of the Dog is a collaboration between Rainforest Art Foundation and Robinson's Rescue that features dog-centric art by local artists. The event is free with a suggested $10 donation to benefit the Foundation. Day Schildkret will create a Mandala of complex patterns of symmetry with elements he has collected in nature – a meditative ritual that is part of his Morning Altars series. SHREVEPORT, Louisiana – Robinson's Rescue and Rainforest Art Foundation are collaborating to host Art of the Dog, a mixed media visual arts show at the Marlene Yu Museum. The exhibit previews during Robinson's Rescue's 10th annual Best in Sheaux ticketed fundraiser on Saturday, March 9, 2019. Rainforest Art Foundation will hold a public reception for Art of the Dog as an early Earth Day celebration on Saturday, April 6, 2019 from 5:00 PM to 7:00 PM. Artists were given loose guidelines, such as, “It must be able to hang on the walls”, and “It must contain dogs”, which encouraged a variety of submissions from the Shreveport-Bossier area. The juried show now boasts dog-centric acrylic pieces, graphite drawings, digital paintings, photography, and other media. From loving tributes to commissioned work, every piece selected is bursting with personality as diverse as the dogs they portray. “Our relationships with canine companions demonstrate the innate desire to connect with nature. We hope that the empathy and love that inspired Art of the Dog can be extended to all living things,” says Foundation Director Stephanie Lusk. Dawn Ash, Maria Ashcraft, Baygent Baker, May Elizabeth Berry, Julie Burton, Christy Chavez, Cathy Cobb, Trudy Daniel, Adena Helm, Jim Huckabay, Jenny Lankford, Douglas Luedeman, Janet Maines, Nina Murray, Karen K. Pearce, Jeanne Marie Reed, Rhonda Rogers, Jessica H. Stevens, Robert Streeter, Wesley Touchstone, Jessica Trihn, and Debbie Unverzagt. The Rainforest Art Foundation is pleased to present Seas Trees Birds & Bees, an exhibition that displays the interconnected artistic vision in the age of the Anthropocene. Through a variety of different artistic practices these contemporary artists express a reverence for all things under the rocks and stars, the sky above and the earth beneath us. Each delicate flower is a gift to be cherished and preserved. Featuring works by Elsie Apacible, Casey Concelmo, Lilian R. Engel, Hillary Waters Fayle, Karen Fitzgerald, Nancy Gesimondo, Karen Kettering Dimit, Hyobin Kwon, Dianne Martin, Brian Soliwoda, Helaine Soller, Day Schildkret, and Suzanne Stroebe. Rainforest Art Foundation is proud to present its newest, nature-inspired photography show, Radiant Birds. The exhibition showcases over 20 different species of birds, each displaying impressive plumage, an interesting pattern, or a vibrant color palette. The show runs from December 7, 2018 through February 1, 2019. From the graceful waterfalls and misty mountains of June Chao that remind us of our heritage to the kaleidoscopic, futuristic photo montages of Elizabeth Molnar Rajec, respect and inspiration are keystones in this exhibition. This year, all of the exhibitors are practicing artists who have reached their eighth decade. Such a milestone is a grand occasion for mounting an exhibit of seasoned, accomplished artists. The opening reception for this exhibition is on Friday, September 28, 2018 at Rainforest Art Foundation in Long Island City from 5:00 PM to 8:00 PM. The exhibition runs from September 28, 2018 to November 27, 2018. This exhibit presents a wide range of media, offering a broad perspective of styles and concerns. Some of the artists themselves pursue varying aesthetic strategies. Gaby Chien for instance, paints in an abstract manner that she finds “therapeutic.” She also works with traditional landscape on ceramic. Further, she displays a satiric and playful side, as in “Mother and Child,” in which a penguin balances the world on its nose. Bill Creston is represented by “Thirty Landscape Paintings in 15 Frames.” His oil on cardboard paintings are painted with verve and surety. Creston is also a multi-media practioner. His videos were recently featured at the Museum of Modern Art. Chuan Teng has refined traditional Chinese calligraphy to perfection. Recently he added acrylic on canvas to his ink-and-brush-on-paper repertoire. Guo-Dong Li is one of the leading contemporary Chinese calligraphers in the world. He won the “Lifetime Achievement Award” from the Chinese American Arts Council of U.S.A. His large brushes are tools to produce enormous energy and dynamism in his depiction of characters. Jen-Jen Liu started out as a chemistry teacher. Liu took to oil painting in the early seventies, and she paints abstract geometric compositions as well as landscape paintings. Min-Tsu Tseng uses actual plants and flowers in her works in an effort to draw attention to nature in hopes of preserving it. In contrast to Tseng’s intimate, charming constructs, Marlene Tseng Yu paints immense canvases that showcase nature’s dynamic forces. Yu’s work is a tribute to our natural world as well as an alarm. The mission of Rainforest Art Foundation is to increase appreciation through art. Founded by Marlene Yu in 2001, it is dedicated to defending nature by raising consciousness about the perilous state of our environment. The octogenarian artists in this show express their affinity for the natural world in representational and abstract forms. Rainforest Art Foundation is proud to feature the Natural Stone Arches and Spirit of Nature in Africa exhibitions during Downtown Artwalk North on February 7, 2018 at the Marlene Yu Museum, 710 Travis Street, Shreveport, LA 71101 from 5:00PM-8:00PM. Admission to this special reception is free with RSVPmymuseum@gmail.com and suggested $10 donation to benefit the Foundation. SHREVEPORT, Louisiana – Rainforest Art Foundation's interactive photo exhibit of strange-looking flowers leads viewers to question whether plants talk and what they may be saying, with an opening reception on Friday, October 21, 2016 from 5:00 p.m. to 7:00 p.m. at 710 Travis Street, Shreveport, Louisiana 71101. The show will be on display throughDecember 9, 2016. The opening reception is free with a suggested $10 donation to benefit the Foundation. Director Stephanie Lusk said, "At Rainforest Art Foundation, we focus on art inspired by nature, the artists, and what the artists are trying to convey through their work. In this interactive exhibit, we see the art of nature itself, we wonder about 'Mother Nature' as the artist, and viewers are welcomed to interpret what 'she' may be trying to convey through her work." The mission of RAF is to increase appreciation of nature through art. Started in New York City in 2001 by artist, Marlene Tseng Yu, RAF has recently expanded to Zurich and will soon open in Frankfurt, striving to bring together nature-inspired artists from all over the world. RAF’s headquarters are located at 710 Travis Street, Shreveport, Louisiana 71101. For more information, please visit www.rainforestartfoundation.org or call (318) 717-9111. SHREVEPORT, La., August 3, 2016 – The Rainforest Art Foundation will bring Amazing Flowers, a traveling exhibition from its New York City location to Shreveport in the fall featuring flowers from various artists with an opening reception on Friday, October 21, 2016 from 5:00 p.m. to 7:00 p.m. at 710 Travis Street, Shreveport, LA 71101. The show will be on display through December 9, 2016. The opening reception is free with a suggested $10 donation to benefit the Foundation. “Occasionally, people send us images of nature’s beauty that we would otherwise overlook. The artists for this Amazing Flowers exhibit are Mother Nature and unknown photographers. However, you might recognize faces and figures in the flowers,” said Director Stephanie Lusk. The mission of RAF is to increase appreciation of nature through art. Founded in New York City in 2001 by artist, Marlene Tseng Yu, RAF strives to bring together like-minded artists from all over the world. RAF’s headquarters are located at 710 Travis Street, Shreveport, LA 71101. For more information, please visit www.rainforestartfoundation.org or call (318) 717-9111. SHREVEPORT, La., April 26, 2016 – Rainforest Art Foundation partners with Pro27's Climbossier to offer free rock climbing on local day of 24-hour online giving called Give for Good. The fundraiser event will take place at Pro27, 3700 Old Shed Rd Bossier City, LA on Tuesday, May 3, 2016 from 5-8 pm. The event is free to the public. This meaningful partnership helps to further the RAF mission to increase appreciation of nature through arts, including alpine arts and outdoor skills development. The goal is to get more people in to try climbing and raise awareness of nature-inspired arts in North Louisiana. Food, door prizes, and donation stations will be available. Multiple activities will be available for different ages and skill levels, including novice and experienced climb routes, and bouldering for small children. Children under the age of 18 must have a parent or guardian there to sign a consent waiver, age 15 and under must have supervision from a parent or guardian for the duration of the event, and children age 16 and older may be left with a signed waiver and picked up afterwards. All participants must have closed toed, tight fitting tennis shoes in order to climb. The mission of RAF is to increase appreciation of nature through art. Founded in New York City in 2001 by artist, Marlene Tseng Yu, RAF strives to bring together like-minded artists from all over the world. RAF’s headquarters are located at 710 Travis Street, Shreveport, LA 71101. For more information and hours please visit www.rainforestartfoundation.org or call (318) 717-9111. Climbossier is the first 24-hour climbing fitness-training center in North Louisiana, located in its parent gym, Pro27 Athletics, at 3700 Old Shed Road in Bossier City. We provide all levels of personal training, host group events, and focus on fun and fitness in a safe environment. We can be reached via facebook.com/climbossier. SHREVEPORT, La., March 29, 2016 – Rainforest Art Foundation is partnering with the Marlene Yu Museum and CoCreative for its 2nd Annual Earth Day Celebration on Friday, April 22, 2016 at 710 Travis St., Shreveport, LA 71101 from 6-9 p.m. The Celebration is free with a suggested $10 donation per family. The event will feature art exhibitions, emerging artists, live music, local green groups, children’s activities, and food and beer for purchase. 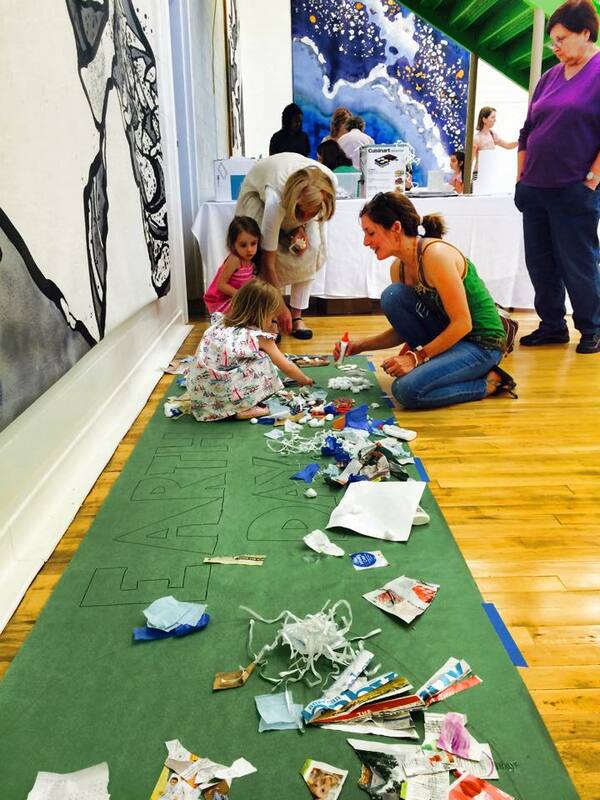 Rainforest Art Foundation held its first Annual Earth Day Celebration in 2015 to help increase the community’s appreciation of nature through visual, performance, and culinary arts. This year it will be bigger with more art, more activities, and more nature love. Proceeds from the Celebration will help RAF and MYM expand on the renovations of their mutual home, the former YWCA building, which was in decline for ten years. RAF’s next fundraiser will also kick off on April 22nd. The 1UP Fundraiser proceeds will be support the Marlene Yu Museum and RAF’s efforts to renovate the Museum’s staircase and second floor. Special incentives are being offered for donations of certain sizes. The Fundraiser will go until May 31st. RAF is a 501(c)3 non profit with the mission to increase appreciation of nature through art. RAF was founded in 2001 by Marlene Tseng Yu in New York City, and opened its headquarters in Shreveport, LA in 2014. RAF provides kids’ educational programming, art exhibitions, and community events to fulfill its mission. For more information, visit www.rainforestartfoundation.org. SHREVEPORT, La., March 4, 2016 – Dennis Cady, based in New York City and the Hudson Valley, will be showing Sculptures by Dennis Cady at the Rainforest Art Foundation from March 17 through May 27. This wood sculpture exhibit will have an opening reception on St. Patrick’s Day, Thursday, March 17 from 6-8 pm, as part of RAF’s 1st Annual 2016 Green Arts Party. The Party is free with a suggested $10 donation, and will feature a cash spiked green apple smoothie bar, sea foam chocolate, and nature-inspired arts. Painter, printmaker, sculptor and designer, Dennis Cady is based in the Hudson Valley and Queens, NY. A native of Oregon, Cady studied at Portland State University, and at the Brooklyn Museum Art School, Pratt Graphic Art Center, and State University of New York. Focused on painting and printmaking for the first half of his career, his love of materials and explorations of three-dimensional form and space in design and architectural settings have drawn him to direct woodcarving. “I seek figural poses that can be translated into masses and voids, which abstractly represent the human figure and the human condition. Nature is my primary inspiration. The drawing is an intuitive idea of what I want to do,” said Cady. SHREVEPORT, La., January 11, 2016 – Rainforest Art Foundation will showcase abstract art from various local and international artists to kick off 2016. “Abstract Nature” will open as part of the Marlene Yu Museum’s Preview Gala on January 21, 2016 from 5:30-8:30 pm at 710 Travis Street, Shreveport, LA 71101. The cost of tickets is $125 in advance or $150 at the door. The Gala is a celebration of the Museum’s first anniversary and RAF’s first year in Shreveport. RAF is hosting a free, community wide birthday party for the Marlene Yu Museum’s first anniversary on Friday, January 22, 2016 featuring the new exhibition. The party is 5-7 pm at the Museum. “Abstract Nature” will show through March 4, 2016. The exhibit will feature pieces from Annie Arbuckle, Janet Barlow, Dennis Cady, Steve Culp, Casey David, Susan Duke, Heather Evans, Robert Fogel, Susan Fortenberry, Mike Greer, Katy Merriman, Eloise Palmer, Rex Patton, Jason Phipps, Antonio Pizarro, Anthony Reans, Lauren Ross, Ellen Soffer, Jeremiah Teipen, Lauri Wallace, Laura Watts, Grace Ge Yao, Chuandai Hsieh Yu, and more. The Rainforest Art Foundation is a 501(c)3 non profit with the mission to increase appreciation of nature through art. The Headquarters of the Foundation is located inside the Marlene Yu Museum at 710 Travis Street, Shreveport, LA 71101. For hours and information please visit www.RainforestArtFoundation.org or call (318) 717-9111. SHREVEPORT, La., November 10, 2015 – New York City artist will show his work for the first time at the Rainforest Art Foundation in Louisiana. “Recycled Sculptures” by John Norwood opens Wednesday, Nov. 18, 2015 from 5:00-6:30 pm with a Museum Member dinner at 7:00 pm. The exhibition will show through Friday, January 8, 2016. Admission is free with a suggested $10 donation. Complimentary hors d’oeuvres and wine will be served. The opening will also feature the 2014-2015 Kids Can exhibit “Oceans of Adaptation” featuring the recycled bottle fish created by kids and volunteers in the community at various events throughout the year. Kids Can is an annual art project meant to teach kids that they can work together to make a difference in our community. Rebekah White designed this Rainforest Art Foundation program and theme for 2014-2015. The installation was designed and implemented by Iris MacLean and Ashley Purland. Norwood creates art out of recycled junk. He is a self-proclaimed impulsive recycler and likes to use his trash to create pieces that interest him. Before ending up in Manhattan where he would meet his wife and start a family, Norwood travelled around Europe studying art, music, and theater, which he felt was the best thing he could have ever done for his education. Rainforest Art Foundation is a 501(c)3 non profit with the mission to increase appreciation of nature through art. For more information visit www.rainforestartfoundation.org or call (318) 717-9111. The Alta and John Franks Foundation for “Louisiana Wild: A Special Evening with C.C. that showcase Louisiana’s distinct environs. Images, 1971–1999; and The Yucatán Peninsula. SHREVEPORT, La., October 2, 2015 – The Truffle Party will be held by the Rainforest Art Foundation at 710 Travis Street, Shreveport, LA 71101 on Tuesday Oct. 20 from 5-7 pm. Admission is free with suggested $10 donation to benefit Rainforest Art Foundation. Guests will be entered into a door prize by voting for their favorite Don Edwards painting in the “Walk on the Wild Side with Don Edwards” exhibition (excluding the Duck Stamp painting). The winner will choose a 20” x 30” canvas giclée of their choice valued at $450, including frame. Black truffle-infused mushroom pasta and chocolate truffles will complement the photography exhibit, “Wild Mushrooms of the Rainforest” by Mother Nature and unknown photographers. Naturalist, photographer and wildlife artist, Edwards' work captures intriguing and realistic moments in nature. He has traveled to Colorado's Rocky Mountains, Wyoming’s Grand Tetons, Yellowstone, Alaska, three trips to Africa - The Masai Mara Game Reserve in Kenya and Kruger National Park in South Africa. His travels have allowed him to witness, photograph and paint some of Earth's greatest wildlife images. SHREVEPORT, La., September 1, 2015 – The Rainforest Art Foundation prepares to start the fall with the very first solo artist show at the Shreveport location, “Walk on the Wild Side”, featuring the works of Don Edwards. The opening reception will be held on Tuesday, Sept. 15, from 5:00-6:30 pm at 710 Travis Street, Shreveport, LA 71101. The reception is free with a suggested $10 donation to Rainforest Art Foundation. Original paintings and giclées will be available for sale, with one third of the proceeds to support RAF’s mission. Light refreshments will be provided. RAF Members are invited to join the artist for dinner (Dutch treat) following the reception. The exhibition will show through November 6, 2015. Naturalist, photographer and wildlife artist, Edwards' work captures intriguing and realistic moments in nature. He has traveled to Colorado's Rocky Mountains, Wyoming’s Grand Tetons, Yellowstone, Alaska, three trips to Africa - The Masai Mara Game Reserve in Kenya and Kruger National Park in South Africa. His travels have allowed him to witness, photograph and paint some of Earth's greatest wildlife images. Edwards has been honored with many achievements throughout the years for his outstanding work in nature-related art. The Rainforest Art Foundation is a 501(c)3 nonprofit with a mission to increase appreciation of nature through art. For more information visit www.RainforestArtFoundation.org or call (318) 717-9111. SHREVEPORT, La., July 28, 2015 –The “Climb for the Museum and Norla” night hosted by Norla Preservation Project, FUNdamentals Society of Marlene Yu Museum and Rainforest Art Foundation, and Climbossier at Pro27 Athletics will take place Monday, Aug. 3rd from 5:30-7:30 pm located at 3700 Old Shed Rd., Bossier City, LA 71111. The Shreveport-Bossier community is invited to help the Museum and Norla with this free with suggested $10 donation community event. All attendees will have a chance to win swag bags filled with local goodies when they sign up for the email list. Prepared Nutrition and Fleur de Crème will provide complimentary infused water, healthy snacks, and ice cream samples. Multiple activities will be available for different ages and skill levels, including novice and experienced climb routes, and bouldering for small children. Children under the age of 18 must have a parent or guardian there to sign a consent waiver, age 15 and under must have supervision from a parent or guardian for the duration of the event, and children age 16 and older may be left with a signed waiver and picked up afterwards. All participants must have closed toed, tight fitting tennis shoes in order to climb. The mission of RAF is to increase appreciation of nature through art. Founded in New York City in 2001 by artist, Marlene Tseng Yu, RAF strives to bring together like-minded artists from all over the world. RAF’s headquarters are located at 710 Travis Street, Shreveport, LA 71101. For more information visit www.rainforestartfoundation.org or call (318) 717-9111. The mission of Norla is to promote and support historic preservation in North Louisiana and to increase the appreciation of our local history and culture. More information can be found at www.norlapreservationproject.com or by calling (318) 548-3503. The mission of the Marlene Yu Museum is to preserve, exhibit, document, and interpret the life and works of Marlene Tseng Yu. MYM opened at 710 Travis Street, Shreveport, LA 71101 in 2014. FUNdamentals Society puts the fun in fundraising to benefit the Museum and partners with other nonprofit organizations. For more information visit www.marleneyumuseum.org or call (318) 717-9111. SHREVEPORT, La., June 10, 2015—The Rainforest Art Foundation introduces the new Biology & Art Exploration Program (BAEP) debuting this summer. BAEP will take place from 9 am – 12 pm every Thursday in July beginning July 9th. The programming for this summer is designed for children ages 3-10, but all ages are welcome. BAEP will take place in the Young Artist Gallery at RAF at 710 Travis Street, Shreveport, LA 71101. Parent or guardian required to be with child at all times. Snacks and refreshments will be provided. Admission is free with a suggested $10 donation per family to benefit BAEP. BAEP is a hands on program designed by Rebekah White to help children learn art and science in a fun environment while making connections between the creative and analytical sides of their brains. The theme for July 9 is Butterflies & Blending. The theme for July 16 is Animals & Abstraction. PEP, a local non-profit group that deals with pet education for kids, will be there for this day with different animals for the kids to learn about. The theme for July 23 is Camouflage & Composition, and the theme for July 30 is Plants & Perspective. Various stations will be set up including an activity paired with a lesson. The focus of these themes is to help kids better understand concepts of art and biology by teaching these subjects together while using an array of different examples, games, and art projects. BAEP is an ever-evolving project that will be adapted into fieldtrips and other future programming. The Rainforest Art Foundation is a 501(c)3 non-profit with the mission to increase appreciation of nature through art. For more information regarding the Biology & Art Exploration Program and to RSVP please visit the Facebook event page at www.facebook.com/events/1578316372456357/.